This special rate is available to all DGCEC registered members. All are welcome! The fee helps us provide such retreat opportunities, and it includes lunch! Tara is the most beloved of all the Tibetan feminine meditation deities. She represents fearlessness, the swift ability to save beings from danger, and protection from suffering. In the beautiful myth of her creation, Tara is said to have sprung from the tears of Chenrezig, the great bodhisattva of compassion. So great was the scope of suffering he saw around him that Chenrezig shed tears in despair at not being able to help everyone, and from the lake of tears that grew at his feet sprang Tara in two forms: White Tara and Green Tara. With their help, we believe Chenrezig's wish to liberate all beings from suffering can be fulfilled. Tara is also a bodhisattva, someone who has vowed to attain enlightenment for the sake of liberating all beings, but she took a special vow: to attain enlightenment in a female body and so always to be reborn as a woman until this was fulfilled. Tara's vow has, consequently, given hope and inspiration to countless generations of women. 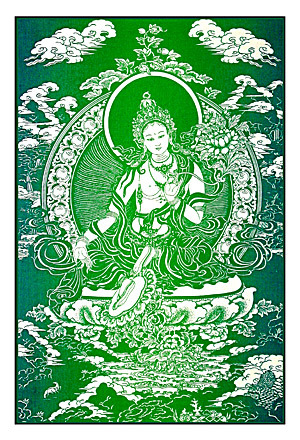 Green Tara is perceived as giving powerful help to remove obstacles. These obstacles may be external or within our own mind - anything that causes us suffering or prevents us from being happy. People pray to Tara for help with worldly problems as well as for help with progress along the spiritual path. Images portray her as quick and fearless in her activity, for example, her outstretched right leg shows her readiness to spring into action whenever she is needed and she is often described as youthful, playful and dynamic. Green Tara is particularly associated with the quality of fearlessness and her special role lies in helping beings to overcome all kinds of fear and the suffering associated with fear. On a worldly level, the Green Tara practice has helped people recover from disease, receive protection from untimely death, achieve success in career and business, find a job, find a partner, and increase wealth. On a spiritual level, the Green Tara puja helps one complete the accumulation of both merit and wisdom and quickly attain enlightenment. Join this opportunity to deepen your practice when Geshe Kalsang Rapgyal offers this special retreat at DGCEC.